We wanted to throw you some yellow and gray paper love... just in case you where inspired by barebone photography's yellow and gray wedding. 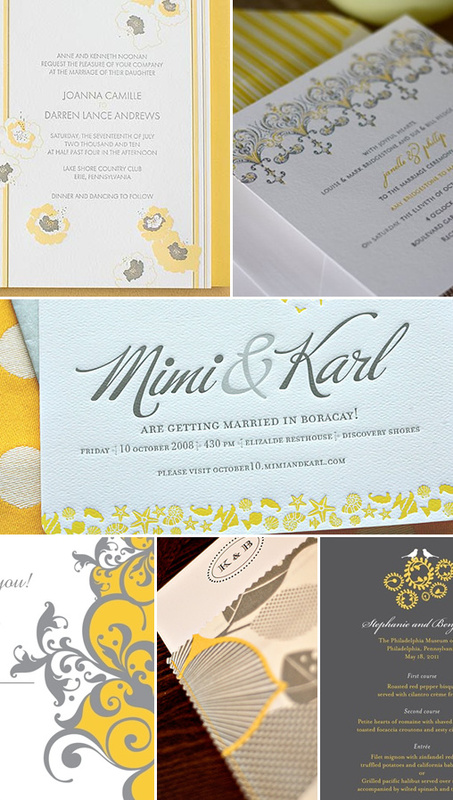 Combining yellow and gray for your wedding color palette is a perfect blend of warm and modern. The above invitations titled, Palm Springs are lithographed on heavy ivory linen and mounted on our double-ply card stock designed by KenzieKate Invitaitons. Truly luxurious. We will start left to right in order to give the proper paper love. First off we have Hello Lucky's Poppy Stripe in gravel and poppy this particular invitations comes in both digital and letter press. Secondly we have some amazing letterpress from Besopke Letterpress Boutique in Australia. We found these over at Oh So Beautiful Paper, Nole has some lovely paper posts that is sure to inspire you. The ocean inspired wedding invitation in the middle belongs to two wedding photographers Mimi & Karl. Designed by Cynthia Bauzon. Which, I think is personally gorgeous. You for sure have to visit their site and see Mimi & Karl's actual wedding in Boracay. It is filled with buttery lemon details that I think you will love. 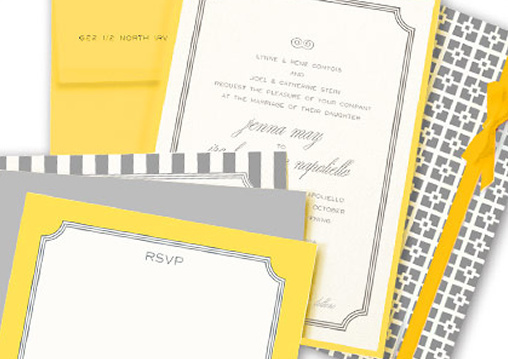 From prettypaperinvitations.com we have the Claire Collection in Saffron, With a subtle vintage theme design and a soft yellow and gray color scheme, this invitation is perfect for the DIY gal. You print all the invites on your own. They have everything you can think of for your paper needs that match the collection. In the middle is an invite that we found over at Pure Photography By Lindsey Tropf, one of her brides designed them and the bride's mother sewed the pouches. You will have to go over to Linsey's blog to see them close up. They are quite unique. Last but by far not least we have the elegant two birds invitation from Wedding Paper Divas. Simple and modern just how we like it.